I’ve said many times that Tokaido is the prettiest game I know. Now it will finally see some competition for that title… from it’s successor. 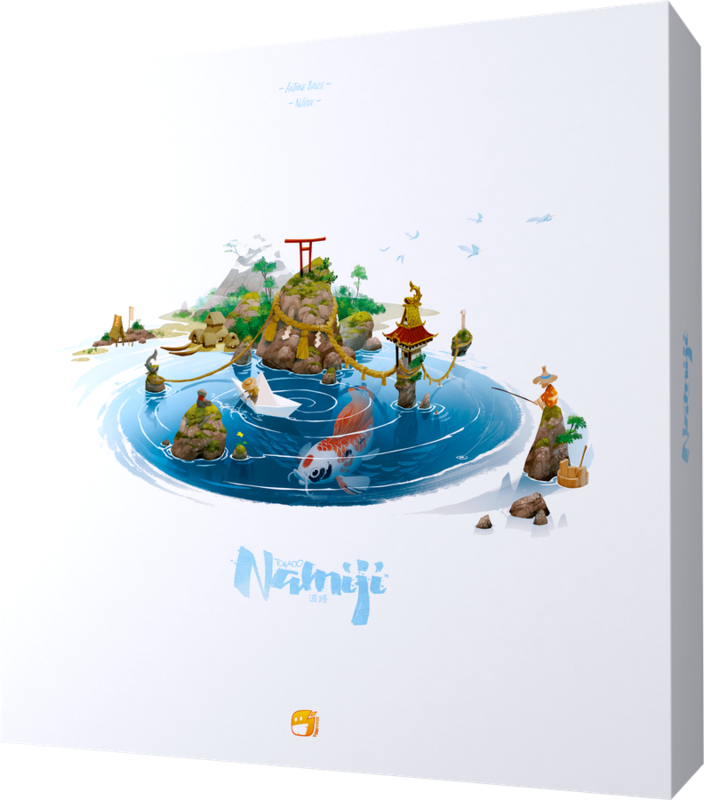 At least the cover of Namiji is every bit as pretty as Tokaido‘s, and I’m sure the rest will match. What we know about the game so far is that it will have a movement mechanism similar to Tokaido‘s where the player furthest behind is always the one to move next. What you’re going to do along the way will differ, though. That just jumped straight to the top of my wanted list. The 80s are pretty much back, and that’s an opportunity for new games based on 80s movies. Games like Die Hard: The Nakatomi Heist Board Game. The best part is that it doesn’t look like a new skin on an old game, like many older games based on movies where, but a real, proper boardgame. An asymmetric one-vs-all game with heroic cop John McClane fighting all alone against Hans Gruber and his gang. Seems like a perfect fit. Quined Games have three interesting new games coming this year. The first two are small card games from Button Shy Games that Quined Games will bring to Europe. Sprawlopolis is a cooperative card game with only eighteen cards. Three of those cards will have the scoring rules for a game, from the remaining cards the players build a city and try to score as many points as they can according to those rules. Circle the Wagons is very similar to Sprawlopolis. There are only eighteen cards, three of them determine how you score points each game. There are differences, though. First, instead of a modern city you build a Wild West town. Second, Circle the Wagons is a competitive game for two players. New game number three is a new strategy game in the Masterprint series. Chicago 1875: City of the Big Shoulders is a heavy economic game. It’s just after the great Chicago fire, and it’s your chance to build your economic empire. Chicago 1875 brings together typical eurogame economy mechanics – hire employees, equip factories, produce goods – with stock manipulation like the 18xx series of train games. That combination is sure to please. Kanagawa is Iello’s beautiful game about Japanese art, where you compose a picture of landscapes and seasons to score points. If you don’t want to read our whole review, suffice to say we really enjoy it. And soon we can enjoy it even more, because the expansion Yokai will freshen it up. Three new elements to add to your paintings – kites, parasols and paper lanterns – are one part of that. The other are the yokai, spirits you can lure to your studio. Gather all three there and you score extra points. But don’t keep them too long, whoever has them when the game ends loses points for them. Evolution by North Star Games is popular for a reason. You get to create your own species of animals with a wide variety of traits, and then you compete with your opponents’ creation for survival. Some will strive, others will be their dinner. Oceans, North Star’s new Kickstarter, is a stand-alone sequel to Evolution. It takes all the good parts, distills them into even more fun, and then it puts the result under the sea. Insert a singing crab here if you like. All the species you create will live in the ocean and start out eating plankton. Then evolution takes its course. For even more fun you get trait cards from The Deep, where species wait that even today we never laid eyes on. 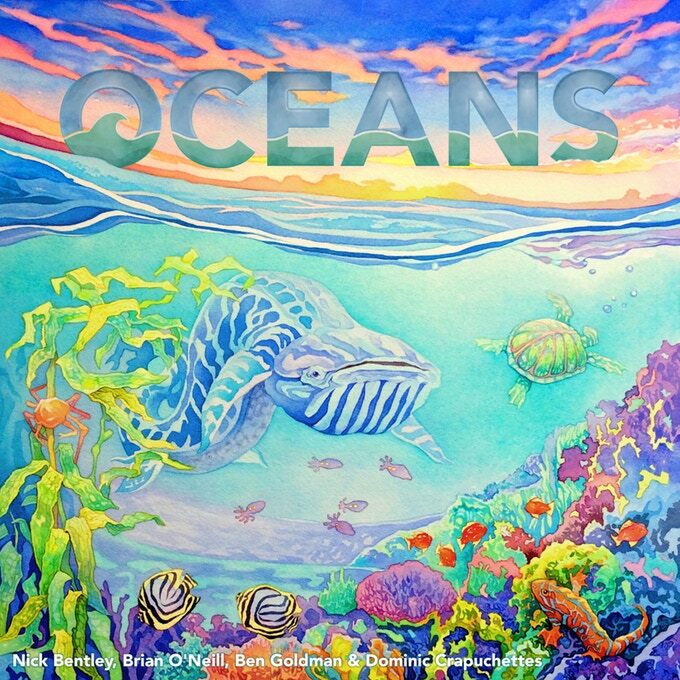 If you’ve been wanting to try Evolution, or you love it and want more of it, then Oceans is exactly what you need. There are plenty of games about building cities. Potemkin Empire may be the first about faking them. Just like Russian minister Grigori Potemkin famously did, players will build wealthy looking facades of villages to make Catherine II believe her country was wealthy and her people happy. There’ll be one problem that Potemkin did not have to put up with. Opponents. Each player is building their own village as a mix of real buildings and hollow shells, and while you can score points for fooling the empress and producing goods sending spies to uncover your opponents’ fraud might be more profitable. This strategic bluffing game found its perfect theme.